Yesterday morning, 11:30 ish, I am making potato salad for today's cookout while Joey's at grocery store. The windows are open letting in an awesome breeze and all the "sounds of outside." Throwing open the screen, I immediately look up and watch in amazement. 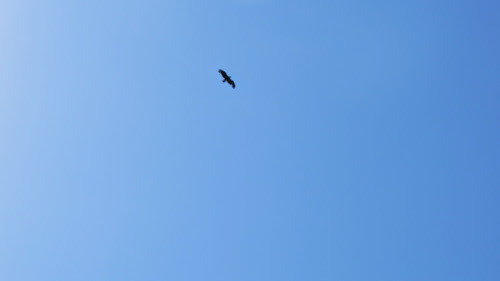 One of the adults soaring high above another bird...a large, dark bird...perhaps one of the immatures from last year. Diving repeatedly at it, it maneuvers over the house yet the adult remains relentless and continues to soar above aiming toward the wing before it eventually retreated, leaving the nesting buffer. The only pic I got is this....if you enlarge it (although doing so distorts the pixels), you can see the missing feathers on the wing!!!! Meanwhile, my potatoes were a tad over-done!!! Yep I see the missing feather. It's a wonder they will attack another young eagle. The over-done potatoes are well worth it! Wish I had something to alert me to the fact that birds are outside! How did I miss your post below?? I check you everyday. Anyway, the birdhouse is definitely beautiful, just wonderful from the embossing to the shape. Isn't it amazing when you can interpret the different calls and cries of birds? I know when a cat is in the backyard, and it doesn't matter which species of bird is giving the alarm. I'm out the door in a flash to scare the predator away. You're like me, protective of the wildlife we love.